An all too familiar scene unfolded, one that I had only been exposed to through social media in other, far more remote and flawed cities. As if to make sure there was no confusion to the point, another unarmed black man was shot dead in the streets. This time, in my seemingly picture-perfect and socially insulated home city of Charlotte. This incident, the killing of Keith Lamont Scott at the hands of the Charlotte Mecklenburg PD, played out not unlike most other highly (and not-so-highly) publicized instances of police brutality. A lone, unarmed black man encounters a group of police officers who, despite outnumbering him, fear for their own lives and react with the swift pull of a trigger. Four shots ring out and in an instant, seven kids are without their father, a wife without her husband, and the strange fruit that once hung from a tree is now lying in a pool of blood in an apartment parking lot. The date was Tuesday, September 20. Mere hours after I had felt an inescapable sense of community with a group of strangers whose only common bond was the love of life, another group of strangers would be bound together in the streets by an inescapable sense of fear and anger under the ominous specter of unjustified death. The universal joy and happiness was replaced by a cold and bitter, yet all too familiar feeling of hopelessness. Just a few hours after those fateful four shots were fired, protests erupted in the area. Fueled by the countless images of violence and bloodshed that the black community had been cruelly exposed to for what seems like an eternity, tensions had reached a boiling point. Like a fire hydrant that had been burst open, the streets of northeast Charlotte furiously flooded with people who had enough. A spontaneous burst of emotion that could no longer be quelled manifested itself in hundreds, perhaps thousands of people who had no more patience for silent hope. An unorganized but intensely passionate protest raged through the night, even blocking part of I85 during the early hours of the morning. Police in riot gear march down Trade Street towards College Ave.
Over the next several days, the protests would continue. Wednesday and Thursday night saw the flame fanned into uncontrollable rioting in Uptown, resulting in the calling of state police, the SWAT team and National Guard. The governor of North Carolina called a state of emergency. The mayor of Charlotte signed a curfew order. The blood of another innocent black man, Justin Carr, was spilled on the same sidewalks I stroll by on a daily basis on my way to lunch. Several of these nights I witnessed this surreal scene for myself. Streets blocked off by Humvees. Lines of riot police blocking other streets in gear that seemed more at home in Fallujah than Mecklenburg County. The unmistakable smell of tear gas in the air. The deafening bang of stun grenades. Protesters with signs, chants and makeshift gas masks fashioned out of t-shirts. Blocked highways. Shattered windows and store fronts. Blood-smeared police wagons. Helicopters circling above. Young girls not old enough to fully understand what’s happening crying in front of city council. Grainy and shaky video of the catalyst incident was dissected over and over Zapruder-style after an awkward wait for it’s release. The emotional makeup of the city was as scattered and fragmented as it had ever been. 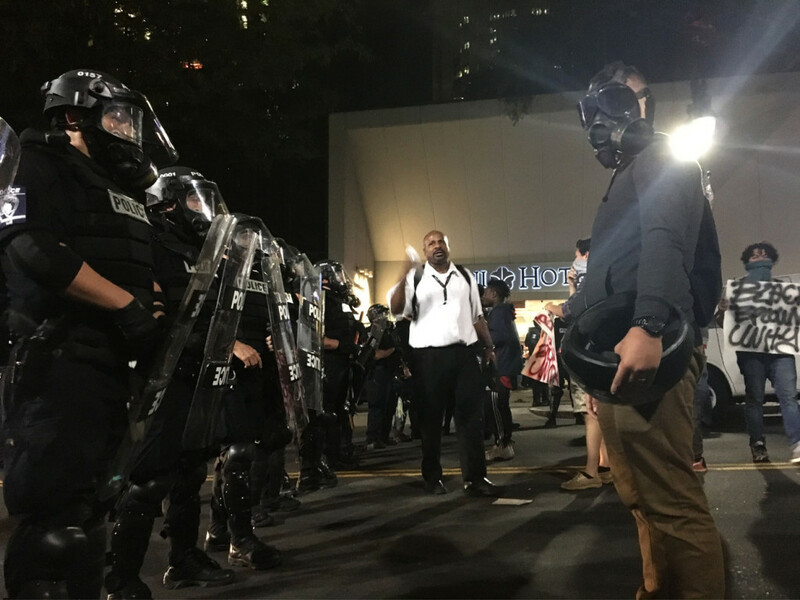 Besides the vitriol of the protesters, others experienced emotional reactions that were reflected, perhaps rooted in, who they were at their core. Some people condemned protesters for lashing out at their own community. Some people lamented the fact that their previously pristine city was being portrayed as chaotic in the national news. Many grappled with an internal struggle that came to terms when they were forced to acknowledge a side of the city that they had tried so hard to dismiss. Others saw it as an opportunity to create chaos without repercussion, or a chance to live out a voyeuristic fantasy. For some, it was finally their time to be heard. All of this played out in the streets. Groups of people who were previously strangers connected by an intangible force, moving in unison. The parallels to what I saw a week earlier in Atlanta were uncanny, except with wildly different emotions. In one week, I saw the spectrum of human emotion play out in the streets.